Apple and CFO Peter Oppenheimer have a history of being conservative with their guidance. Listen to a conference call, or read a transcript and you’ll hear repeated remarks about forecasts the company can “confidently meet.” It’s like a lawyer that won’t ask a question in court without first knowing the answer; similarly Apple seems incapable of making a projection without being sure it will come true. The history tracks back quarter after quarter. In summer 2007, when Apple issued third quarter guidance, they forecast dramatically decreased margins and profits as a consequence of a then ambiguous product launch. It was going to be costly, they said. Earnings as a result, they told analysts, could be as low as 65cents a share; well below the trend line. When the actual numbers came in Apple reported $1.01/share. Last quarter, the first of their fiscal 2008 was more of the same. Conservative guidance from Q4 ’07 was trumped with record results but then the next round of forward guidance was received like a doomsday projection. By now one would think the markets would be used to it. It’s an obvious enough pattern: first Apple gives conservative guidance about future earnings. The economy, a product shift, a parts shortage…something, warrants more caution. Next, the numbers come: conservative projections are blown away by stellar earnings that probably shouldn’t have been a surprise. Then, lest expectations get too lofty, the upside of the stellar earnings is tempered with another round of conservative guidance. It’s the Apple M.O., the “Oppenheimer effect”: Apple’s way of under promising, over delivering then under promising again. Wednesday’s, on cue Apple announced another round of earnings that followed the script. Already, the company had reset expectations to a forecast for Q2 profits of 94c/share, thirteen cents less than analysts’ prior expectations of $1.09/share. Apple had also projected revenue would be short at $6.8b versus analyst consensus of $6.99b. Now the numbers are out. Steve Jobs was “delighted” with the result. Peter Oppenheimer said “We’re thrilled.” And surprise, surprise, the numbers exceeded original expectations and then some. •Apple earned $1.05 billion or $1.16 a share on revenue of $7.51billion. Both revenues and earnings easily beat Apple’s prior projections. They also showed substantial improvement over last year’s result of $770m net profit (87cents/share) on revenue of $5.26billion. Overall, it was Apple’s best March quarter in history. •Within the computer segment, Apple had a very successful quarter. The company shipped 2,289,000 Macs. That total units represents a 51% increase in volume and 54% increase in revenue over the same period last year. The growth rate was the company’s highest ever. Also notable within the category, portables were up 61%. •In the iPod subset of the music category, as expected, sequential growth was has slowed. Apple sold 10.64 million iPods – a gain of 1% in total units sold and (courtesy of pricier products like the iPod touch) revenue was up 8%. •In actual music sales, iTunes officially surpassed Wal-Mart (according to NPD) to become the largest music retailer in the US. The store had more than 50million customers and 85% of the market for downloaded music. •For iPhones, which are being closely watched in light of Apple’s projections to sell more than 10million units, quarterly sales were 1,703,000. Total revenue recognized for the phone, accessories and payments from partners amounted to $378m. Deferred revenue, which includes a sum of monies related to both iPhones and Apple TV units was $1.93b, up from $1.44b in December. •Within the retail category, Apple was up 74% year over year. Apple stores sold 458k Macs and returned an average store revenue of $7.1m (a 48% increase from the $4.8m reported a year ago). Operating profits at the stores were up nearly double to $334. Approximately 45 new stores will open in 2008. About half of these will be likely be outside the US. The new international outlets will include the first Apple stores in China, Australia and Switzerland. •Other important financials: Cash flows generated from operations equaled $4billion. The cash balance at the end of the quarter was $19.4b. Gross Margin was 32.9 percent, off from 35.1 percent a year ago but still slightly ahead of Apple’s projected result. Beyond the figures, which by any measure were mostly all positive, Apple shareholders have some other things to be satisfied with and look forward to too. For starters there’s the iPhone. Not only is it doing well, it appears poised to do even better. Since the beta software development kit was announced on March 6th, more than 200k developers have signed up and downloaded the kit. More than 1/3 of the fortune five hundred is represented. Some impressive software is likely on the way. In addition to upcoming applications, Apple expressed almost certain confident they will make good on their projection to sell 10million this year. They key to that success, they say, is international expansion. (Considering 3G is almost essential for parts of Europe and Asia, Apple’s confidence is a sign a second generation phone is highly likely by June, or July). Another positive appears to be component parts. Pricing for DRAM and Nand Flash hit low levels in March. “Historically low,” according to the analysts call. This favorable pricing is expected to continue and should help margins in the present quarter. As for new products and all the gossip and rumor about iPhone shortages, analysts did their best to get insights. Apple held to the line and kept silent. Nothing was revealed about what’s in the pipeline. Nor did Apple add much color regarding inventory shortfalls for the iPhone other than to admit that demand was high. Looking ahead: Last quarter in the earnings call Peter Oppenheimer was crystal clear. 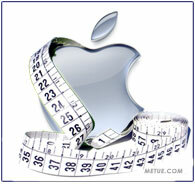 He told analysts, “[Apple is] giving very strong guidance. We are very confident we will achieve it.” And guess what, that’s exactly what they did. This second quarter, the wording isn’t much different. In forward guidance for Q3, Apple is projecting revenue of $7.2b and earnings of about $1.00. Those numbers seem a little low, and it’s likely, they will be.